Khari Herbert and Tarique “Tweety” Moses, were victorious in weekend track and field competitions in Virginia and Arizona, as several other athletes improved on their personal best indoors. With their respective performances at weekend, all four of the territory’s athletes competing indoors for Jr. Colleges, had qualified of the March 2-3 National Jr. Colleges Athletics Association Championships in Lubbock, Texas. 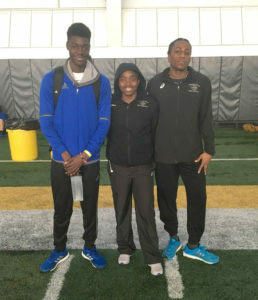 Herbert, a former St. Augustine University quarter miler, smashed the 400m meet record at Liberty University’s 4th Annual Darius Dixon Memorial Invitational on Saturday. Herbert, who opened his 2018 season last week in winning the 400m with with 48.46 seconds, demolished the 48.90 seconds meet record with his winning time and seasons best of 47.92. Moses, coming off season opening marks of 23.00 seconds and 1 minute 25.80 seconds in the 200 and 600m respectively at the Pima Aztec Indoor Invitational, improved upon his marks after an earlier injury limited his performances. The Central Arizona College Sophomore exploded with a personal best of 1 minute 21.63 seconds to win the 600m at the Jim Mielke Track and Field Invitational in Pima, Arizona, to book his ticket to nationals. He also won his 200m heat with a personal best effort of 22.42 seconds, to place third overall. At the Frank Sevigne Nebraska Huskers Invitational, Iowa Central College Sophomore Nelda Huggins was fifth in the 60m dash, after recording a time of 7.50 seconds. The BVI sprinter advanced to the final by winning her heat in 7.47 seconds, the fourth best prelims time. She’s currently ranked No 1 in the 60m dash in the Jr. College rankings with her time of 7.40 seconds and she’s the defending 60m champion, who ran 7.31 seconds last year. Huggins is No 13 overall in the 200m, with her season’s best of 24.93 seconds. She was second in the event at nationals in 2017, with a time of 23.79 seconds. Teammate and Long Jumper Akeem Bradshaw had a season low leap of 6.17m (20’3”) on his opening attempt and placed 24th overall. He was sixth in the Triple Jump after cutting the sand at 14.28m (46’10¼”). Bradshaw has also qualified for the Jr. College Nationals in both events. He’s ranked No 6 in the Triple Jump with his leap of 14.68m (48’2”) and No 14 in the Long Jump with his 6.94m (22’9¼”) mark. Also at the same competition, Barton County College freshman Adriano Gumbs won his 600m heat in 1 minute 21.72 seconds. He was seventh overall and improved on the 1:22.30 from a week ago. He will join Moses in the event at Jr. College nationals. Moses is ranked No 14 and Gumbs No 17. At the Texas A&M Charlie Thomas Invitational in College Station, Texas, Josh Hill broke 49.00 seconds in the 400m for the first time in his career, running the Olympic Development 400m. Hill finished in seventh place with a time of 48.82 seconds.